Edgar Allan Poe's classic tale gets a reboot in this fourth game in the well-loved Dark Tales series. You and your detective companion Dupin have been summoned to the seashore to help William LeGrand discover the exact location of a treasure lost hundreds of years ago. But LeGrand isn't the only one with designs on the pirate booty… A masked villain tries to make off with the code, and a mysterious woman in a veil seems to be connected. 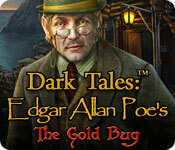 Dark Tales: Edgar Allan Poe's The Gold Bug is rated 3.5 out of 5 by 44. Rated 5 out of 5 by mohammad2015 from Excellent work and a great series by ERS Game Studios!! This is the release order of the Dark Tales series : 1- Murders in the Rue Morgue 2- The Black Cat 3- The Premature Burial 4- The Gold Bug 5- The Masque of the Red Death 6- The Fall of the House of Usher 7- The Mystery of Marie Roget What a fantastic game!! Amazing graphics, amazing gameplay, amazing music. I can't say enough good things about this game. Rated 5 out of 5 by Ruckus777 from Dupin does it again! This game is absolutely fantastic! This is the second game of the series that I'd played, the first being House of Usher, and I think this one truly beats it. Graphics are still beautifully amazing, and I love how the lips move when characters are speaking. The storyline is thrilling and just absolutely engaging. Dupin's character has to be one of my favorite parts of the entire series-- not only is he a pleasure to look at and listen to (ahem), but he is a great well-rounded character. What I also like is that you're actually in the game, and the characters react to you. Your character is never assigned a gender, either, so that's also a plus! Overall, I think this is a great game. If you're looking for a great game with an intriguing storyline, beautiful graphics, and a (cough) good-looking character (cough), then this is the game for you! Rated 5 out of 5 by JustTheFacts from Dark Tales Back On Form GAME COMPLETED TWICE M. Dupin has invited his ‘friend’ (that's us - another promotion!) 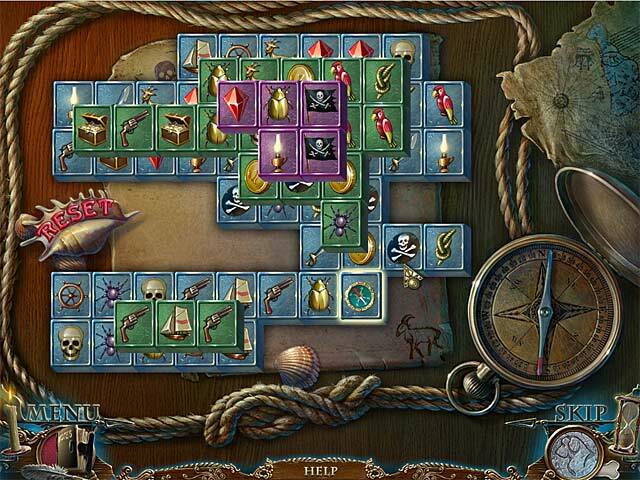 to join him as he pays a visit to a friend who believes he has found a map to Captain Kidd’s lost treasure. This is another story by Poe and one we simply can’t hear too much of, and so we’re off to the seaside! The introduction to this game is worth the price. Before we even start we have: • A delightfully dramatic opening, very movie-like • Very un-ERS-like and totally wonderful original music • Replayable puzzles and HOS Very soon after, we also meet our new side-kick, a very well trained St Bernard who will help us by sniffing out clues – literally, of course. And there’s much to do, the code needs deciphering, a masked man and a mysterious woman seem to be intent on harming our friend. The puzzles are good, all pretty easy and well explained, with enough variety in them to stay interesting. The HOS come in two modes, the standard interactive list and the newer style of silhouettes where to find one item you must first find another and another and... I for one am thankful to see a game using a variety of HO styles. We have more help than usual with a journal, a map, and a hint button. The graphics are of course excellent, extraordinary colour. M. Dupin remains charming (I was amused to discover, though, that we are a little more cynical about our famous friend these days – the journal is quite amusing at times. ), the good guys win in the end, how could we want more? I heartily recommend this game! Rated 5 out of 5 by Missiongirl from I really love this Series It's funny, I have just left a slightly negative review on another game that everyone loved and this one is one of my favourites and yet everyone else doesn't seem to agree! Why is that I wonder? I love the voice overs, I love the logic of the game. The HOS are fun with a small level of difficulty but there is certainly areas that require a little more thought. I suppose that's it. I do get bored easily and if a game is too random and difficult, I can lose interest but this one keeps mine throughout. If you liked the others, then you will definitely like this one. Rated 5 out of 5 by janniemst from I wish I would have purchased the CE. This was so much fun....and I even finished it in one day with a few sittings! Yes, it was too short but I still give it a five because I enjoyed it that much. Was the visual and sound quality that great?...No, not really, but it didn't matter to me. I liked the dog...I wish he would have been used more in this game. The HO scenes are my favorite kind, where you have to look for only a few items and one thing found finds another and then another is found and that causes another to be found and so on...ending up with one usable item to be used in the game. There were the regular search HO scenes also so I liked the change between the two types. I know for some this game was too simple but I enjoy games such as this once in awhile without the 'dark and dreary' effects and magic and witches. This was fun and had some places to go...and I didn't need a map or journal with this game. I do wonder what the extra chapter in the CE game would have held for me though! Rated 5 out of 5 by rosekaufmann from ONE TERRIFIC GAME Exciting, fast-paced adventure – easy to follow and skillful plot. Outstanding graphics, inspiring music, beautifully conceived details. Good voice overs. At the beginning, I thought play was rather simplistic and easy (no question of where to go or what to do), but it became tougher to figure out the puzzles and HOS as the game continued. Just my type of game. You can play casual, advanced or real detective (no help at all) modes. 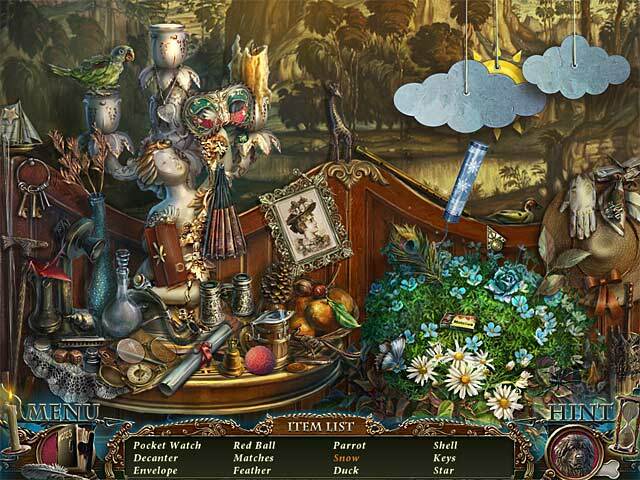 You can unlock and play hidden objects and puzzles to your heart’s content in the SE and CE editions, as well as a movie, music, bonus chapter, concept art and a screen saver in the CE edition as you complete the game. A well designed game. You find the cutest little Newfoundland puppy, complete with bow, to help in your quest. I'd buy the CE if you can. Extras well worth it. Rated 5 out of 5 by bishky from Another winner!! I have been waiting for this game to come out and I am not disappointed at all. Very well drawn, fun games, interesting plot that takes you all around. You get a great helper (and darn cute too) and the hint button is a help when you need it. Some of the puzzles are a little difficult but you can always skip then if you want. Well worth the wait!! Rated 5 out of 5 by wadeckiburn from Excellent game Well they did it again, another excellent game. You are travelling with Inspector Dupin(again), and going to see a friend of his who thinks he`s discovered Captain Kidd`s treasures. HO scenes" different than others, as you will have silhouettes of the object you must find and then sometimes will have to interact with other HO such as you might find a shovel handle and then have to blend it with the shovel part to make a whole shovel that you have to find and maybe use to find another object. 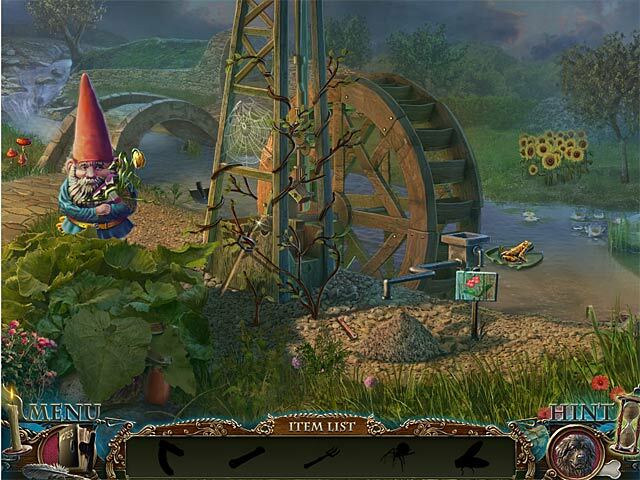 There are even puzzles in the HO scenes that you have to solve to find hidden objects. You get to use a Newfoundland (dog) that aides you on your quest. When he barks, check your inventory items and see which has a 'paw print', that`s the item you will need and use. Hint charges slowly (for me), and I`m playing on the easy part. There is 3 levels that you can play on, and can be changed in the game at any time. Over-all a very, very easy game so far, I`m not sure how long the game is, as I`ve enjoyed the demo, so I bought it(with a free game) and am now downloading the rest of the game. Puzzles are some of the usual, such as turn one thing and several things move and you have to line them up(Gecko tails), frogs jumping over one another on lily pads(to get to the other side), and Majhongg tiles, etc. But the HO scenes are what sold me, like I stated above, not your usual hidden object scenes. Those who are experts at these types of games may say it`s too easy for them(which it is),as there is a lot of hand-holding involved, but so far a very relaxing game for me. I have all of the Dark Tales games and this is the easiest. Rated 5 out of 5 by JayTeeLine from Excellent Poe Story with beautiful graphics and FUN!! Just the right amount of difficulty for me, without being frustrating. Best of all a game about The Gold Bug without any 'bugs' itself. Can that be possible ? Love the story book atmosphere with good cut scenes, and nice voice overs. Easy on the eyes too!!!! I loved it!